Tesla Motors unveiled their uber-chic Roadster, a powerful electric vehicle that looks, feels and drives like many other high-end sports cars Wednesday night. The main difference is the noise. Powered by a 3-phase, 4-pole AC induction motor, the Roadster can go 130 mph and does 0-60 in about 4 seconds, all completely silent. Tonight was the grand unveiling of the Roadster in a decorated airport hangar in Santa Monica, CA. I don't ride in many sports cars, and I certainly have never been in one that zips across an airport's tarmac without so much as a whisper. But tonight I got a quick ride in the Roadster and all I could hear from the passenger's seat (not even Gov. 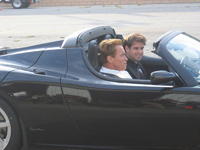 Schwarzenegger, who flew in for a brief look at the car, was allowed to drive it) was wind noise. And myself saying "Wow" under my breath. Check out the exclusive video of the unveiling that features interviews with Tesla Motors CEO Martin Eberhard and the company's chairman Elon Musk, as well as footage of the car in motion from both inside and outside the cockpit - after the jump! Check out the rest of my report, a gallery of LIVE and OFFICIAL pics, and Tesla's press release with full specs after the jump. 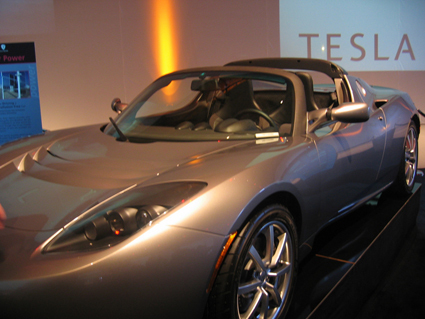 Tonight's unveiling was also an invitation to purchase the Roadster when it is released in mid-2007 (for about $80,000-$120,000). The company is offering the first 100 Tesla Roadsters as Signature models. Musk said that the people who buy the Signature cars will not only be getting an incredible sports car, but will be helping to pay the R&D costs for future Tesla Motor vehicles. And that's what tonight was really about: the future. Gadget, an L.A.-based mechanic who converts ICE cars to EV and was seen in the movie "Who Killed The Electric Car? ", and that film's director Chris Paine, were right behind me in line for the test ride. Paine filmed the promo video for the Roadster that was projected onto the walls. Earlier in the evening, Tesla Motors CEO Martin Eberhard said that, "An electric sports car was the way to fundamentally change the way we drive in the USA." 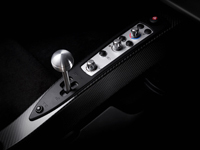 Gadget and Paine agreed – although Gadget is convinced his conversion process is going to be more effective than $100,000 sports cars in getting EVs onto the streets – and after seeing what is possible with an EV, I have to admit there is pretty much endless possibility out there in electric motor land. Lastly, there have been a lot of rumors floating around about the Roadster's specs, and tonight Tesla Motors finally let us know exactly what the deal is. Some of the rumors are true: the car can go 250 miles or so on a single charge (thanks in part to regenerative breaking that charges the AC motor) and will have all of the crash test ratings and safety features (airbags, GPS) when it is released. You can read the entire spec sheet and press release after the jump and at the Tesla Motor's website. 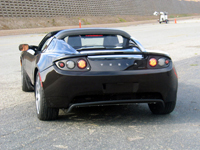 SAN CARLOS, Calif. – (July 19, 2006) – The first performance electric car manufactured by Tesla Motors, the high-performance, zero-emissions Tesla Roadster, was unveiled before a throng of well-wishers, car buffs, and potential customers Wednesday evening during Tesla's "Signature One Hundred" event at Barker Hangar. Celebrities in attendance included actor Ed Begley Jr., producer Richard Donner, businessman Michael Eisner, PayPal founder (and Tesla Motors Chairman) Elon Musk, Participant Productions' Founder and CEO Jeff Skoll, also of eBay fame, and actor Bradley Whitford, who starred in "The West Wing." "We're thrilled to have the support of top people from so many different industries," said Martin Eberhard, CEO of Tesla Motors. "High-tech, CleanTech, entertainment, automotive, you name it. It's gratifying to have others realize the significance or what Tesla Motors is doing." 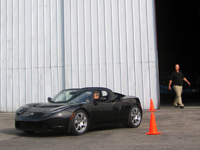 "The Tesla Roadster delivers sports car performance without using any gasoline," said Eberhard. "This is what we hoped to achieve when we started the company three years ago, to build a car with zero emissions that people would love to drive." 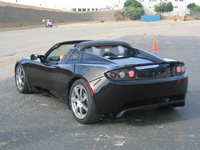 Using a unique two-speed manual transmission, the Tesla Roadster's power comes from a 3-phase, 4-pole AC induction motor coupled with the Power Electronics Module (PEM) which provides multiple functionality of inverting direct current to 3-phase alternating current, the charging system, and the regenerative braking system. The Roadster's Energy Storage System (ESS) provides power to the entire vehicle, including the motor. Its durable, tamper-resistant enclosure includes: 6,831 lithium-ion cells; a network of microprocessors for maintaining charge balance and temperature among the batteries; a cooling system; and an independent safety system designed to disconnect power outside the enclosure under a variety of detectable safety situations. The Tesla Roadster is capable of driving up to 250 miles (EPA Highway) on a single charge, a range roughly triple that of previous mass-produced electric vehicles, like General Motors' EV1. "It didn't make sense to sell a car that couldn't go 90 miles on a charge. You'd spend more time charging the old EVs than driving them," said Eberhard. "Lithium-ion technology, which has been proven in many different applications, has allowed us to achieve exactly what we thought it would in terms of power, range and efficiency." The body design of the Tesla Roadster, which included a collaborative effort by the company's employees, has been headed by Barney Hatt, Principal Designer at the Lotus Design Studio in England. The result is a sleek, stylish sports car that will appeal to enthusiasts and environmentalists the world over. Research and Development for Tesla Motors is based at the Corporate Headquarters in San Carlos, Calif. Engines are manufactured at Tesla's facility in Taiwan, and assembly takes place at Tesla's plant in England. The company currently employs 70 people, including teams in California, the U.K. and Taiwan. The background and experience of Tesla's employees mirrors the vehicle itself, drawing from diverse expertise in the electronics, automotive and Internet industries. Tesla Motors creates vehicles that conform to all U.S. safety, environmental and durability standards. Tesla's cars include modern safety equipment such as airbags, front crumple zones, side impact protection, and 2&frac12; mph bumpers. Tesla will sell cars in the U.S. only when they pass the Federal Motor Vehicle Safety Standard (FMVSS).